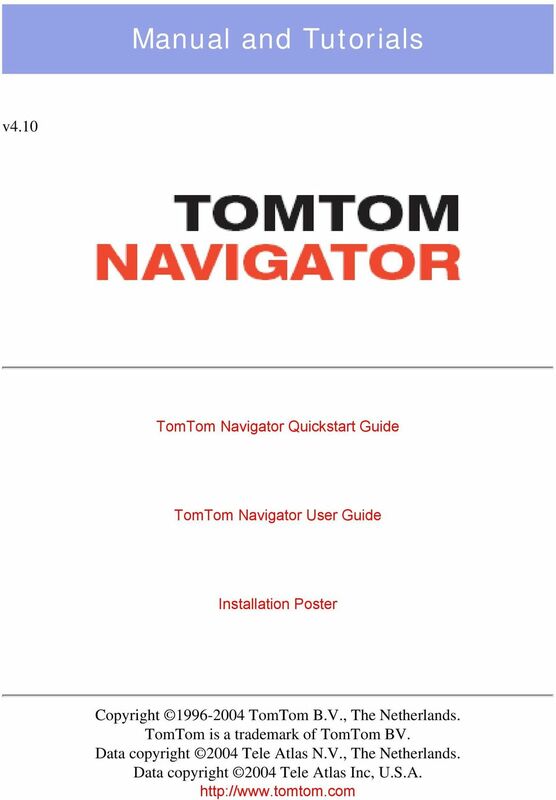 1 Manual and Tutorials v4.10 TomTom Navigator Quickstart Guide TomTom Navigator User Guide Installation Poster Copyright TomTom B.V., The Netherlands. TomTom is a trademark of TomTom BV. Data copyright 2004 Tele Atlas N.V., The Netherlands. Data copyright 2004 Tele Atlas Inc, U.S.A.
4 1. Tap an option. 2. 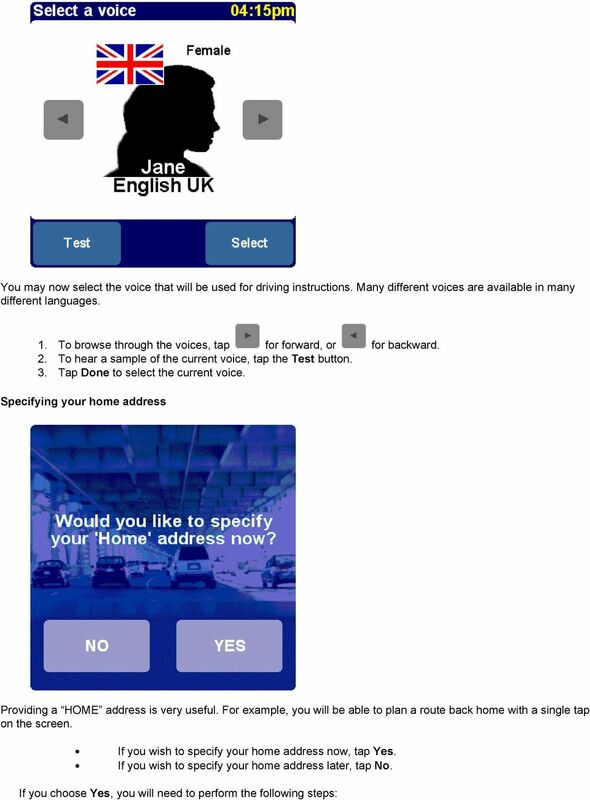 Tap Done Choosing how time is displayed Selecting a voice 1. Tap an option. 2. Tap Done. 8 Your position is indicated by the sign. A. To zoom in, tap [+] in the upper right-hand corner. B. To zoom out, tap [-] in the upper left-hand corner. To access the menu (which provides access to all the options and functions available), tap the screen roughly in the middle. The menu The menu appears when you tap the main screen. It provides access to all functions. First page of the menu Second page of the menu 1. To access any of the functions, tap the corresponding icon. 2. To browse to the next menu page, tap. 3. To return to the main screen, tap Cancel. Planning your first route Perform the following steps to plan a route from your current position to a particular address. 1. In the menu, tap Navigate to. You are now asked to choose a type of destination. Some of the items on this menu may be dimmed, indicating that they are (currently) unavailable. 9 2. Tap Address. 3. 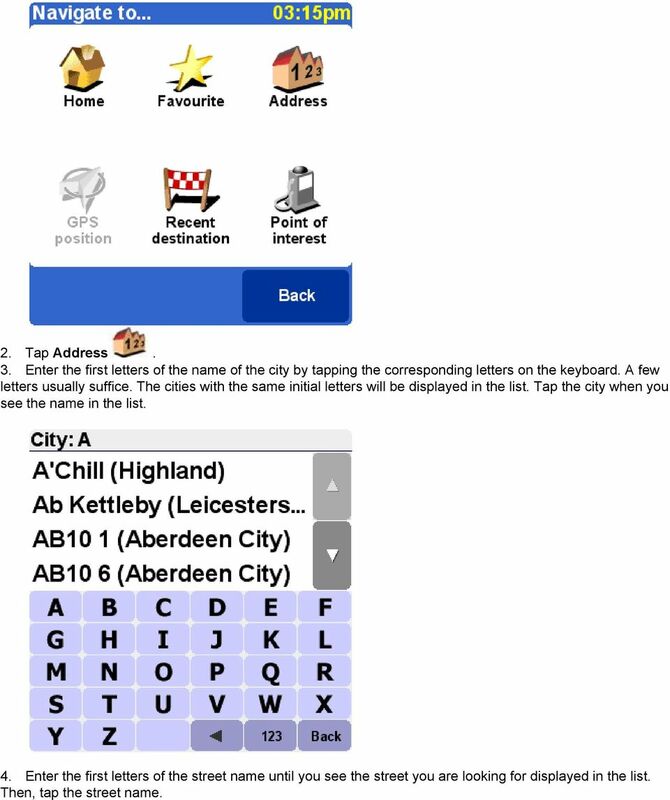 Enter the first letters of the name of the city by tapping the corresponding letters on the keyboard. A few letters usually suffice. The cities with the same initial letters will be displayed in the list. Tap the city when you see the name in the list. 4. Enter the first letters of the street name until you see the street you are looking for displayed in the list. Then, tap the street name. 12 The title bar shows your current destination and the current time. The map shows your route from start to finish. Underneath the map you can see the total travel time and the length of the route. The side bar shows the state of your battery, the current strength of the GPS satellite signal, and your longitude and latitude. Finally, the small button below shows your application version. 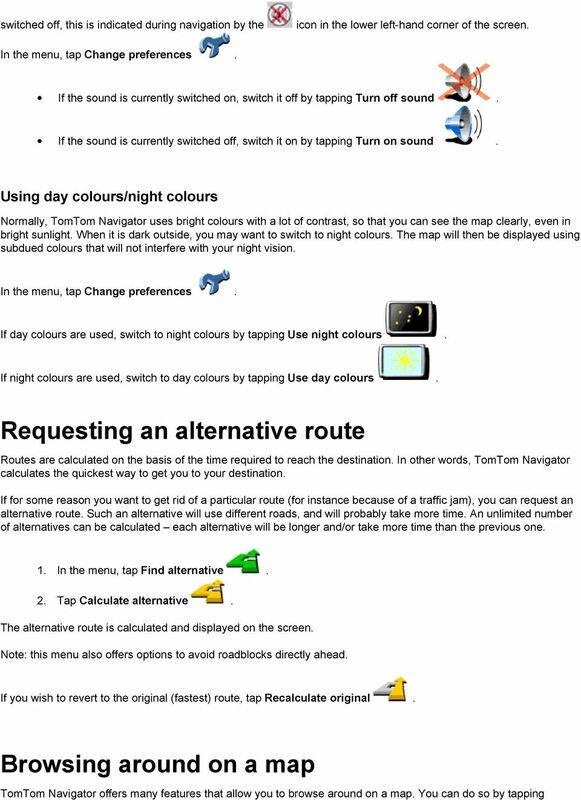 To display a complete list of route instructions, tap Route. To browse around on the map of your route, tap Map. To return to the main screen, tap Done (or tap anywhere on the map). To get more information on the GPS signal, tap the GPS information bar on the side. To get detailed information about your software version, tap the version button on the side. Ignoring the planned route TomTom Navigator is very flexible. If you take a different turn from the one TomTom Navigator proposes (whether by mistake or on purpose), TomTom Navigator will adjust almost instantly to the new situation. It will keep guiding you to your destination from your current position as fast as it can calculate. Chapter 3 Points of interest Points of interest (often abbreviated to POI ) are locations such as parking garages, petrol stations, hotels, restaurants, hospitals, airports, etc. When planning a route you can select a nearby point of interest as your destination. You can also ask TomTom Navigator to show or hide certain POI on the main screen or on the map. Enabling/disabling particular points of interest In the preferences, you can specify which POI categories are of interest to you. 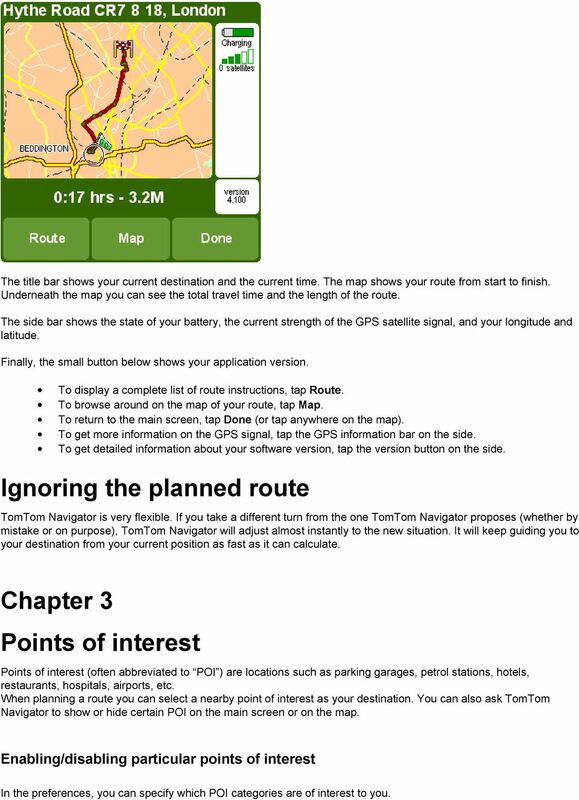 15 Browse map in the menu, or tap Map in the route summary screen. On the map, you will find all the items you might find on a normal, paper map, such as cities, town, roads, streets, rivers and lakes, points of interest (such as petrol stations, restaurants and hospitals) etc. You will also find more dynamic and personal elements, such as your current GPS position, your favourite locations, or your current departure and destination. The blinking icon represents your cursor. Simply tap the map anywhere to place the cursor at that position. To increase or decrease the scale of the map, move the white square at the side of the screen up or down. The map will zoom in (or out) relative to your cursor position. To browse around, simply tap the map and drag it around. Button Function This button allows you to search for a specific location and place your cursor there. You use it to locate: an address; one of your favourite locations; your home location; a recent destination; a nearby point of interest (e.g. a hotel or petrol station); your current GPS position. The cursor provides functions for your cursor location (i.e. the location indicated by the blinking You can: calculate a route from your current location to the cursor location; find a point of interest near the cursor location; centre the map around the cursor location; turn the cursor location into a favourite. icon). 16 Options The options button allows you to change the properties of the map that is currently being displayed. For instance, you can decide to show more or less roads and streets, or street names, or to show or hide points of interest or favourites. You can even show or hide specific categories of points of interest, by tapping Show POI in the options screen. By tapping this button (in the top right corner of the screen), the map will be will re-centred around your GPS position. Done Tap Done to return to the main screen. 18 4.18. Set schematic speed Change voice Switch Language POI appendix 5. Installation 5.1. Using the CD-ROM 5.2. Requirements for installation 5.3. First time installation of TomTom Navigator with a map 5.4. 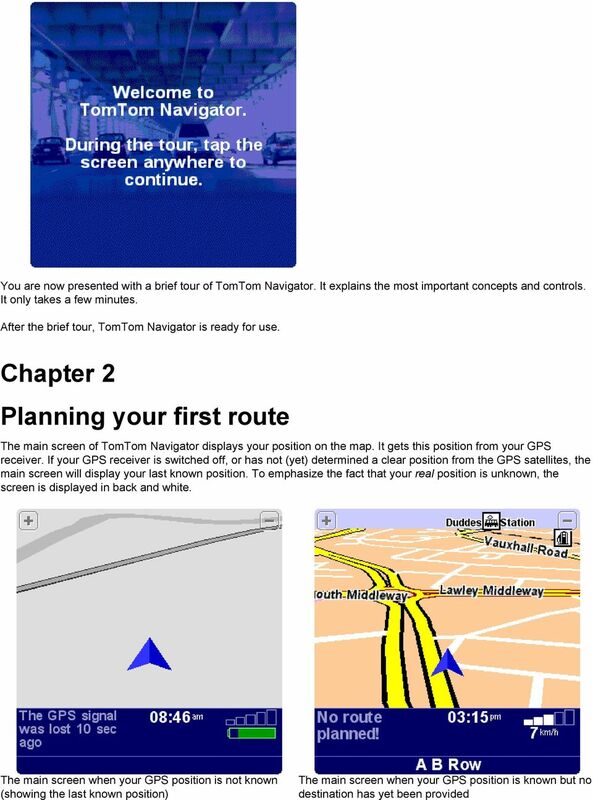 (Re-)Installing TomTom Navigator, voices and maps 5.5. Major Roads Map 1. What you see on the screen 1.1. The main screen The main screen of TomTom Navigator is used to navigate to your destination. Your position is displayed on the map using your GPS receiver. If your GPS receiver is switched off, or has not (yet) determined a clear position from the GPS satellites, the main screen displays your last known position. To emphasize the fact that your actual position is unknown, the screen is displayed in black and white. "Sound off" warning indicator Next instruction The name of the next street Journey information Speed/distance indicator Your current GPS position "Zoom in" button "Next highway" indicator "Zoom out" button The dark red path indicates the calculated route. The route instructions will guide you along this path to reach your destination. Your next driving instruction shows an arrow for the direction to follow and a distance indicator (presented in your distance units preference) when to do it. The bottom of the screen shows the street name you will reach if you follow the current driving instruction. If the "sound off" indicator is not shown, the displayed instruction will be accompanied by voice instructions. If necessary, use the sound on preference to switch on the voice instructions. To increase or decrease the scale of the map, tap to zoom in or to zoom out relative to your current position. This keeps working when covered by the "next highway" indicator. The journey information shows the current time, estimated time of arrival and the time left to reach your destination. 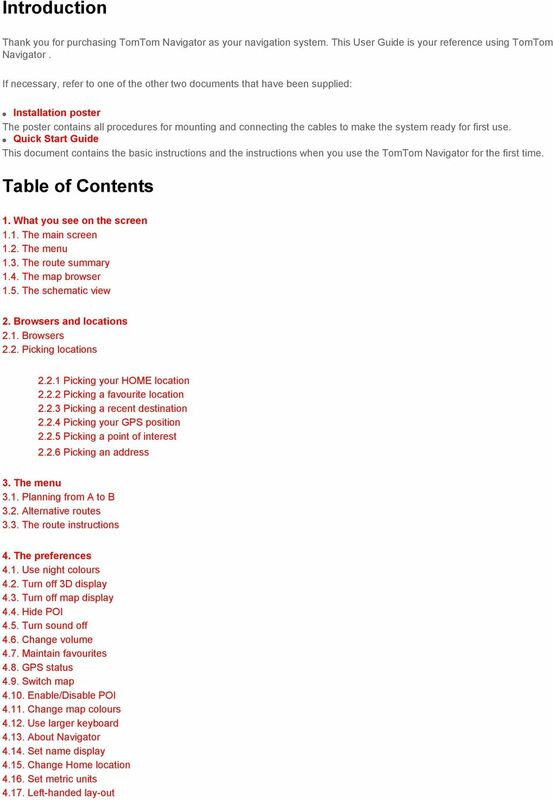 20 The 10 main menu options are explained in chapter 3. 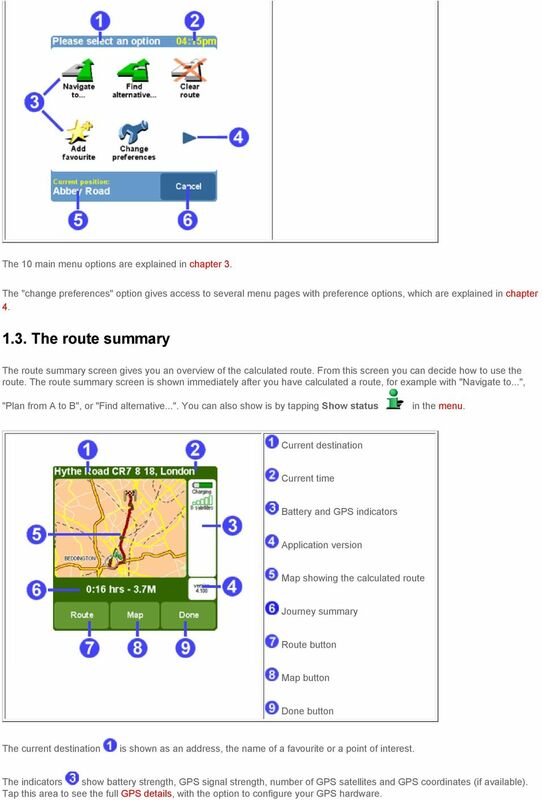 The "change preferences" option gives access to several menu pages with preference options, which are explained in chapter The route summary The route summary screen gives you an overview of the calculated route. From this screen you can decide how to use the route. 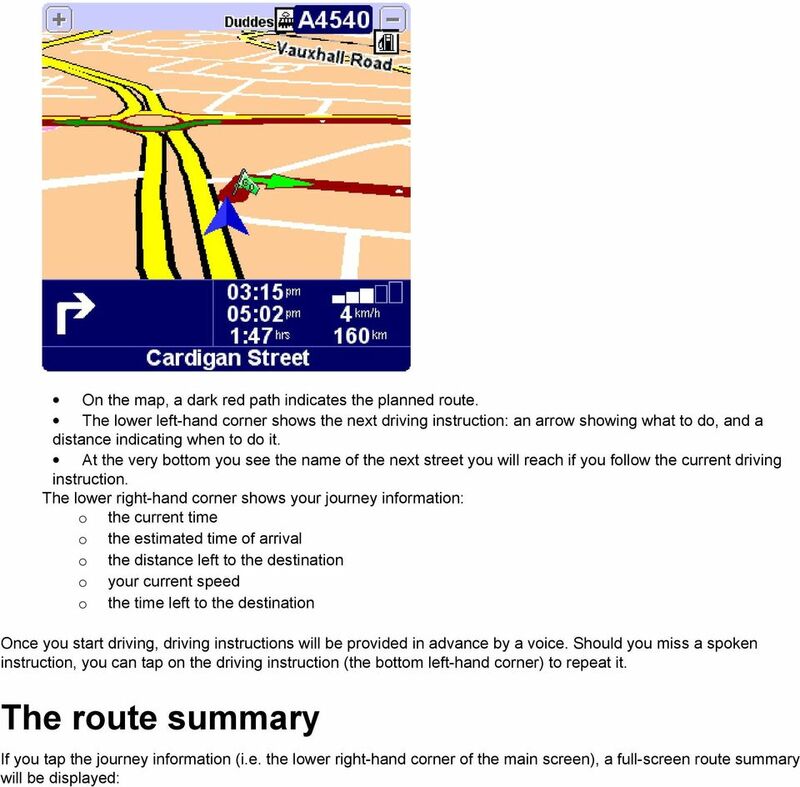 The route summary screen is shown immediately after you have calculated a route, for example with "Navigate to...", "Plan from A to B", or "Find alternative...". You can also show is by tapping Show status in the menu. 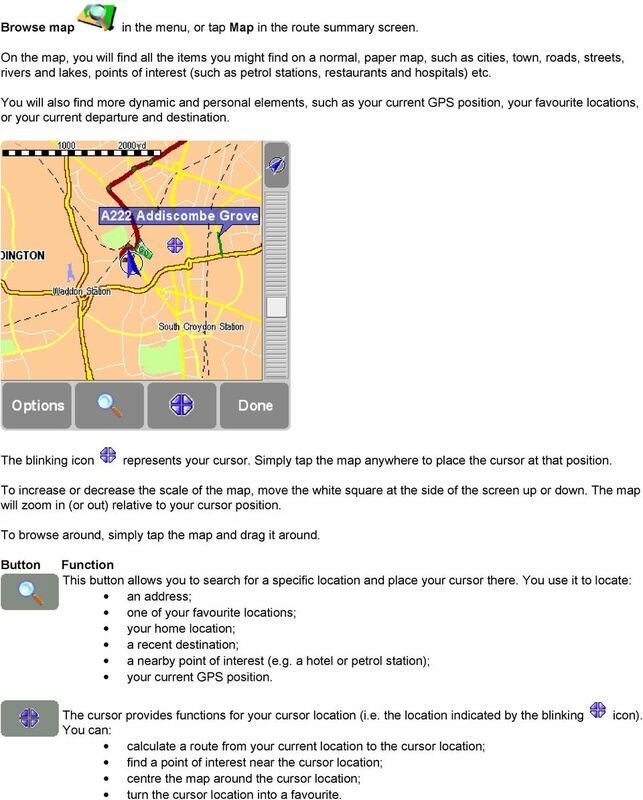 Current destination Current time Battery and GPS indicators Application version Map showing the calculated route Journey summary Route button Map button Done button The current destination is shown as an address, the name of a favourite or a point of interest. The indicators show battery strength, GPS signal strength, number of GPS satellites and GPS coordinates (if available). 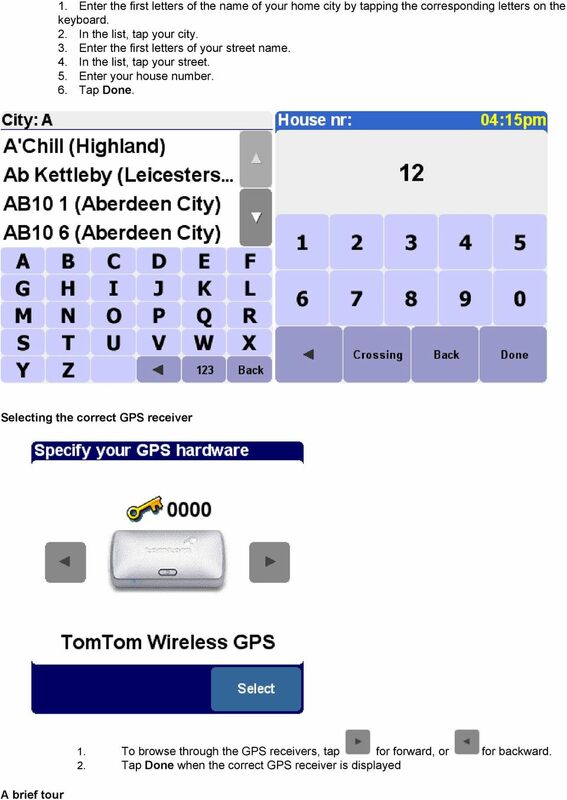 Tap this area to see the full GPS details, with the option to configure your GPS hardware. 21 Tap the application version to see the application version and copyrights. The journey summary shows the estimated total journey time and total distance (presented in your distance units preference). If the route shown is an alternative route, the original journey time and distance are also shown for comparison. Tap Route to display a complete list of route instructions. Tap Map to browse around on the map of your route. Tap Done to start navigating in the main screen The map browser TomTom Navigator offers many features that allow you to browse around on a map. You can do so by tapping Browse map in the menu, or tap Mapin the route summary screen. On the map, you will find all the items you might find on a normal paper map, such as cities, towns, roads, streets, rivers and lakes, points of interest (such as petrol stations, restaurants and hospitals) etc. You can also find more dynamic and personal elements, such as your current GPS position, your favourite locations or your current departure and destination. Scale bar Cursor position GPS button Zoom slider Your current GPS location Options button Search button Cursor button Done button The blinking icon represents your cursor. Simply tap the map anywhere to place the cursor at that position. To increase or decrease the scale of the map, move the zoom slider (white square at the side of the screen) up or down. The map will zoom in (or out) relative to your cursor position. To browse around, simply tap the map, keep your finger on the screen and drag it around. 22 option function The search button allows you to search for a specific location and place your cursor there. You use it to locate: an address one of your favourite locations your home location a recent destination a nearby point of interest (e.g. a hotel or petrol station) your current GPS position Related topic: To learn more about the options to search a location, see the "Picking locations " description. The cursor button provides functions for your cursor location (i.e. the location indicated by the blinking icon). You can: Options calculate a route from your current location to the cursor location find a point of interest near the cursor location centre the map around the cursor location turn the cursor location into a favourite The options button allows you to change the items that are currently being displayed on the map: show the number of roads and streets show the number of street names show or hide all points of interest show or hide all favourites Tap Show POIto use the Enable/disable POI preference to specify which categories of points of interest can be displayed. Note: The option to show or hide all points of interest in this menu is the same as Show POI / Hide POI preference. Changes have direct effect on this preference. Tap the GPS button (in the top right corner of the screen) to re-centre the map around your current GPS position. Done Tap Doneto return to the main screen The schematic view Instead of the main screen, a much simpler, schematic design can be used to display driving instructions. Some people prefer the simplicity of this "at-a-glance" schematic display. You can switch to the schematic display using the turn off map display preference. You can also set TomTom Navigator to hide the map only when you go faster than a certain speed. 23 "Sound off" warning indicator Next instruction Journey information Speed/distance indicator The name of the street you are currently on A large copy of the schematic instruction arrow The name of the next street The screen items are described in Chapter Browsers and locations 2.1 Browsers Tap a line to select it; if you change your mind and wish to go back to the previous screen without selecting anything, press the BACK or CANCEL button If there are more lines than fit on the screen, you can browse to the other pages of the list by tapping and. When a line has too much text to fit on the screen, it will be abbreviated. When you tap an item and keep your finger or stylus on the screen, the item will be adjusted in size in order to show the complete text. browser with collapsed keyboard browser with popped-up keyboard Most browsers allow you to search for items with a particular name. Simply type some letters of the name, by tapping the corresponding buttons on the keyboard. If no keyboard is visible, tap the keyboard symbol in the bottom corner open it. 25 See chapter 2.1 for details about how to browse, search for particular items, etc. You can turn locations into favourites using the "Add favourite" option in the menu, or using the "Add as favourite" cursor action in the map browser. You can rename or delete favourites using the Maintain favourites preference Picking a recent destination Every time you plan a route, the destination is automatically added to the list of recent destinations. If you have never navigated anywhere, the "recent destination" icon in the location menu will be dimmed. Otherwise, you will be presented with a browser listing the most recently used destinations. See chapter 2.1 for details about how to browse, search for particular items, etc. 26 2.2.4 Picking your GPS position If you tap the "GPS position" icon in the location menu, your select your current location (i.e. the position measured by your GPS devices). If your GPS devices is off or disconnected, or if there is no valid GPS signal, the icon will be dimmed, or produce a "no valid GPS signal!" message when you tap it. For more information about your GPS signal, see chapter Picking a point of interest Points of interest (often abbreviated to "POI") are locations like parking garages, petrol stations, hotels, restaurants, hospitals, monuments etc. Most TomTom Navigator maps offer huge amounts of POI (a notable exception is the Major Roads map, for which the POI icon in the location menu will be dimmed). In order to pick a POI, you first need to pick a POI category. As there are many categories, TomTom Navigator first presents you with a menu listing the five categories that you have most often and/or most recently used. Either tap the one you want, or press the button to select a category from the complete list: Once you have picked the POI category you want, TomTom Navigator will provide a list of POI, in order of proximity. 27 Note: The POI browser only shows the nearest points of interest, not all of them. Therefore, if you are looking for a particular point of interest, say a restaurant with a certain name, you may have to type some (more) letters of that name before it appears in the list. Related topics: See chapter 2.1 for details about how to browse, search for particular items, etc. in the list of POI categories or in the list of POI. See chapter 4.4 about how to show or hide POI on the main screen See chapter 4.10 about how to show or hide particular POI categories Picking an address STEP 1. Specifying the city or postal code area In TomTom Navigator, you find an address by going from the general to the specific. In other words, you first specify the city or postal code area, then the street name, and then the house number or crossing. Although this is slightly different from how addresses are normally written down, there are many advantages to searching for an address in this order. The first thing you are therefore asked to do, is to specify a city, town or village. Type the first letters of its name. A few letters usually suffice. When you see the name of the city in the list, tap it. TomTom Navigator will initially present you with a list of recently used city names. In other words, after you have used TomTom Navigator for a while, you will often be able to pick the city without typing any letters at all. TomTom Navigator also knows the postal code zones for most countries. This means that in those countries, you can enter the (first part of) a postal code instead of entering the name of the city. 28 STEP 2. Specifying the street Once you have selected a city, you will be asked for a street name. Once again, a few letters usually suffice. Note that TomTom Navigator is quite capable of finding streets on the basis of misspelled or incomplete names. This also means that if you are looking for a street such as "Avenue de Mazagran", you could forget about the "avenue" and simply start typing "MAZ". The street browser initially offers recently selected street names in the selected city. In other words, after you have used TomTom Navigator for a while, you will sometimes be able to pick a street without typing any letters at all. Streets that cannot be entered by car are marked with a special symbol: The browser may also contain items that aren't so much streets as "locations". This includes certain parks and squares, as you might expect, but also crucial landmarks such as railway stations: and "city centres":. 31 Lets you explore and search for locations in the map browser. It is a digital version of your paper map with a lot of detailed information available. Browse map Related topic: To learn more the map browser screen, see the "Map browser " description. Shows the route summary screen. This is the same screen as displayed after a route has been calculated. Show status Related topic: To learn more the route summary screen, see the "Route summary " description. This option gives you a brief guided tour of the application, the most important menu options, and the map browser. Guided tour Shows the calculated route as written instructions. Chapter 3.3 describes this function in detail. Show route instructions Note: Show route instruction is not available when you have no route calculated. 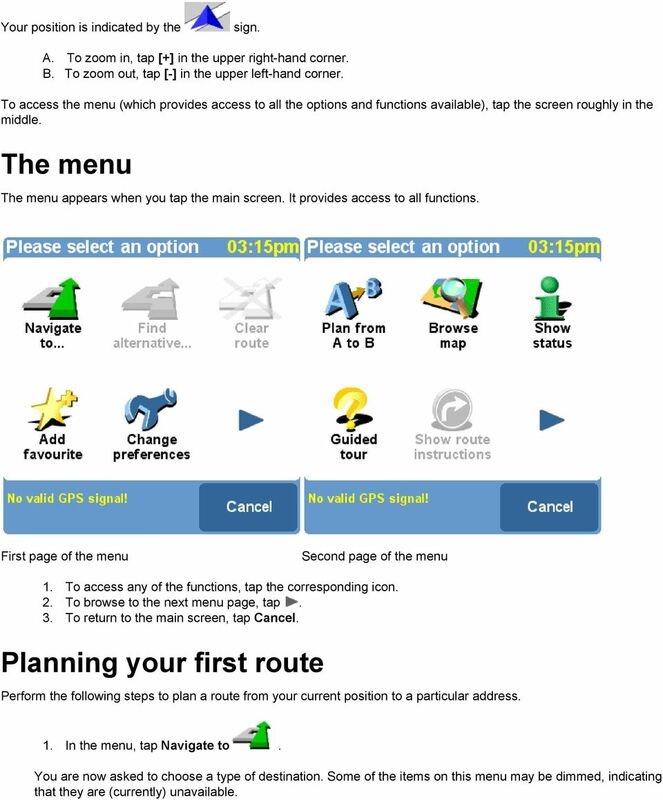 3.1 Planning from A to B Calculate a route between two selected locations, in the menu tap Plan from A to B. Without a valid GPS signal you can still calculate a route using "planning from A to B". This is typically the case when you are not in your car. "Planning from A to B" is a valuable function when you want to prepare for your trip in advance, you want to find out how long a certain would take or when you want to find out how someone should travel to you. The difference with "Navigate to..." is the departure location of your trip. Where "Navigate to..." uses you current GPS location as the departure, "Planning from A to B" requires you to enter the departure manually. Use the locations picker to set any type of location to depart from. 33 the quickest way to get you to your destination. If for some reason you want to get rid of a particular route (for instance because you drive into a traffic jam or a road construction), you can request an alternative route. Such an alternative will use different roads, and will probably take more time. An unlimited number of alternatives can be calculated - each alternative will be longer and/or take more time than the previous one. option function Calculates a new route using the same departure and destination as the current route. As many new roads as possible are used for the new route. Calculate alternative Avoid roadblock The new calculated route is shown in the route summary screen, from which you can start navigating or exploring the calculated alternative. Calculates a new route using the same departure and destination as the current route. The roads for the next 2000 meter of the current route are not used in the new route. This gives you the opportunity to avoid roadblocks directly ahead. Avoid roadblock is available as separate menu options for 100, 500, 2000 and 5000 meters. The new calculated route is shown in the route summary screen, from which you can start navigating or exploring the calculated alternative. If you are not happy with any of the alternatives routes TomTom Navigator will recalculate the original fastest route. Recalculate original The recalculated route is shown in the route summary screen, from which you can start navigating. 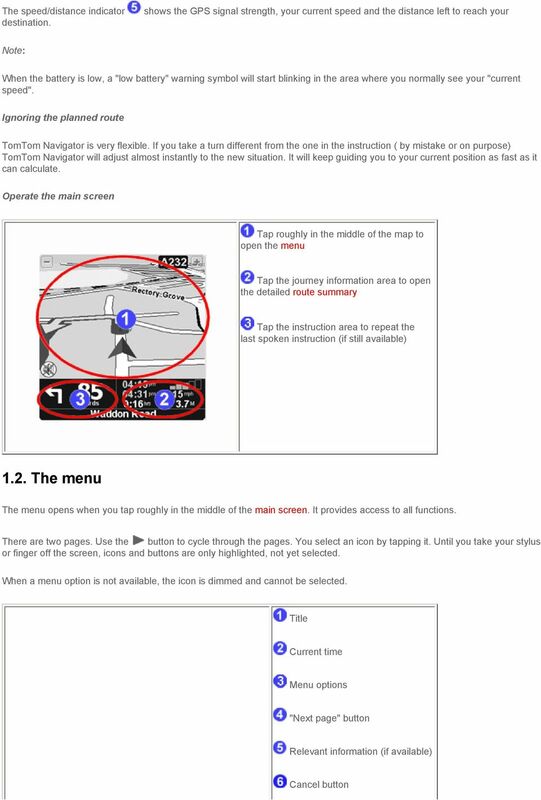 3.3 The route instructions Show the route instructions from the menu by tapping Show route instructions summary screen will show you the route instructions.. Also the ROUTE button in the route All the driving instructions from departure to destination are displayed. Every line shows the estimated time until the next instruction, the instruction arrow and the street name you should drive onto. 36 You can navigate using either the map display or the schematic display. The map display gives you the most detailed information about your current situation, including a map. The schematic view is focussed on the next driving instruction. If map display is used, switch to the schematic display by tapping Turn off map display. If schematic display is used, switch on the map display by tapping Turn on map display. Related topics: For more details about the schematic view, see the "schematic view" description. To automatically hide the map when you drive faster than a certain speed, use the "Set schematic speed" preference option. Note: If you have set a "schematic speed" your display will automatically turn off the map display when your driving speed exceeds the schematic speed. The "turn map display on" option will NOT override this safety feature Hide POI / Show POI The main screen can show points of interest (POI) as icons in the map. Every category of POI will be shown using its own icon. This Hide POI/Show POI preference either shows all specified POI categories or no POI's on the map. If Points Of Interest are shown, they can be hidden by tapping Hide POI. If no Points Of Interest are shown, you can make them appear by tapping Show POI. Note: Only those categories of POI that have been enabled will be shown; If no POI categories have been enabled, you will not see any POI on the map even if you use the "Show POI" option. Related topics: To specify which particular categories of Point Of Interest are shown, use the "Enable/Disable POI" preference option Turn off sound / Turn on sound You can turn off the voice that gives navigation instructions. You will then have to rely on the visual instructions on your screen to navigate. To hear the navigation instructions again, turn on the sound once more. If the sound is switched off, this is indicated during navigation by the icon in the lower left-hand corner of the screen. If the sound is currently switched on, switch it off by tapping Turn off sound. If the sound is currently switched off, switch it on by tapping Turn on sound. Related topics: To change the volume of the spoken instructions, use the "change volume" preference option. 38 If your favourite list is empty the icon is dimmed and cannot be selected. If the location changes for one of your favourites you should create this as a new location. Deleting a favourite will be executed immediately without a confirmation. Related topics: For an explanation on how to use the browser to select a favourite, see the browser usage description GPS status Check your GPS signal or configure your GPS by tapping GPS status. The GPS status screen shows detailed information on the GPS signal you receive: On the GPS status screen is shown: The longitude and latitude are displayed using the distance units The driving direction is shown in degrees compared to the north The driving speed The Universal Time Code (UTC), the time according to the GPS signal which is not the local time An icon which shows, when circling, if your GPS device is well connected and it receives data The schematic representation of the sky showing the positions of the satellites Measuring bars for the signal strength of each visual satellite, locked satellites are shown in blue Configure GPS Use and to browse through the list of supported GPS devices until your GPS device is shown. Specify your GPS device by selecting DONE. Note: When you select "Other Cable NMEA GPS" as your GPS device you might need to specify a baud rate. Refer to your NMEA GPS receiver manual to find out the used baud rate. For many devices this will be 4800 baud. 40 Whether POI are shown at all is controlled by the "Show POI" preference option. 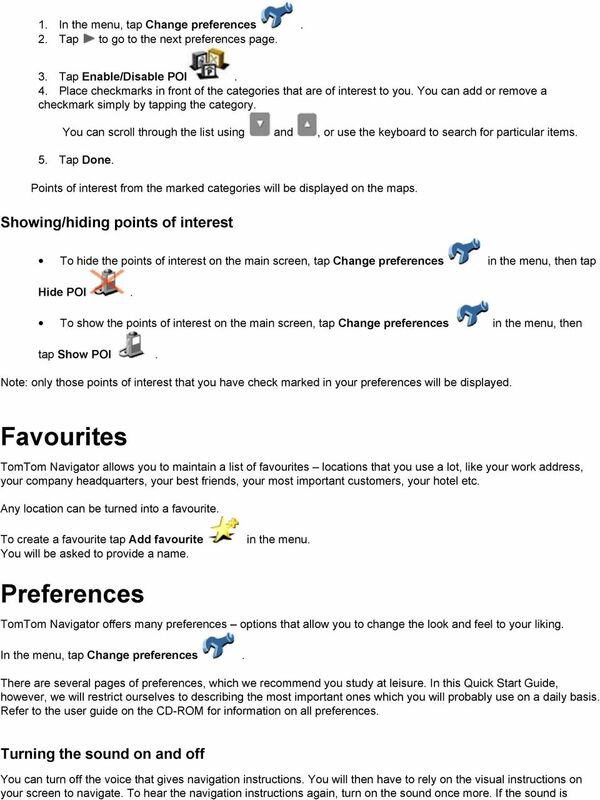 For more information about how to use browsers, see the browser usage description Change map colours Change the way maps are coloured by tapping Change map colours. All maps are shown using a colour scheme, this determines the colours used for each element shown in the map. Use and to browse through the list of available colour schemes until your preferred scheme is shown. Specify your colour scheme by selecting DONE. You need to specify a colour scheme for day colours and after that for night colours. Related topics: To switch between day and night colours, use the "Use night colours" preference option Use larger keyboard / Use smaller keyboard This preference lets you select a larger keyboard (which makes it easier to enter letters) or a smaller keyboard (which leaves more room for items in the list). If you use the smaller keyboard, switch to the larger keyboard by tapping Use larger keyboard. If you use the larger keyboard, switch to the smaller keyboard by tapping Use smaller keyboard. 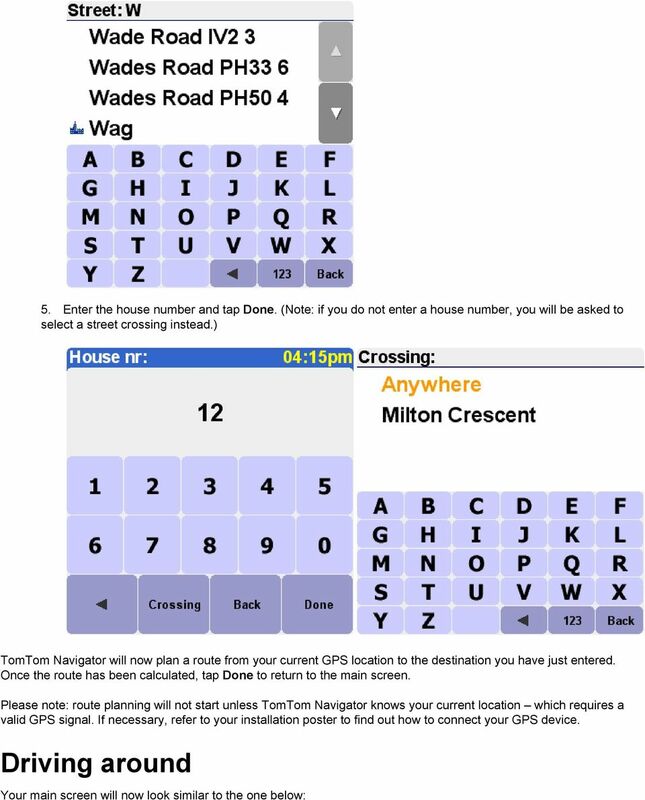 41 Related topics: For more information relating to the use of the keyboard, see the sections about using browsers and entering an address About Navigator To see the version and copyright details of your TomTom Navigator software, tap About Navigator Set name display Set your name display preferences by tapping Set name display. This preference lets you specify how you want to show names in the main screen: Show house numbers prefixed De-emphasize E-roads Show street names on map addresses will be displayed as 112 Oxford street rather than Oxford street 112 local road numbering are preferred over European road numbering, e.g. A10/E35 is preferred over E35/A10 the names of roads and side streets are shown on the map while you are driving Place a checkmark in the boxes of the options you wish to enable. 44 4.17. 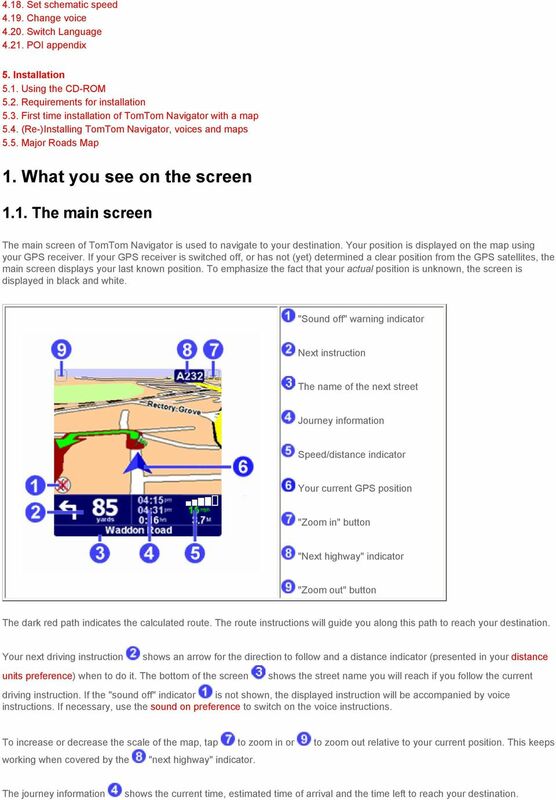 Left-handed lay-out / Right-handed lay-out You can optimise TomTom Navigator for either right-handed or left-handed operation. Left-handed operation, for example. means that important buttons and controls will be located on the left side of the screen. As a result, you will be able to operate them with your left hand without obscuring the screen. 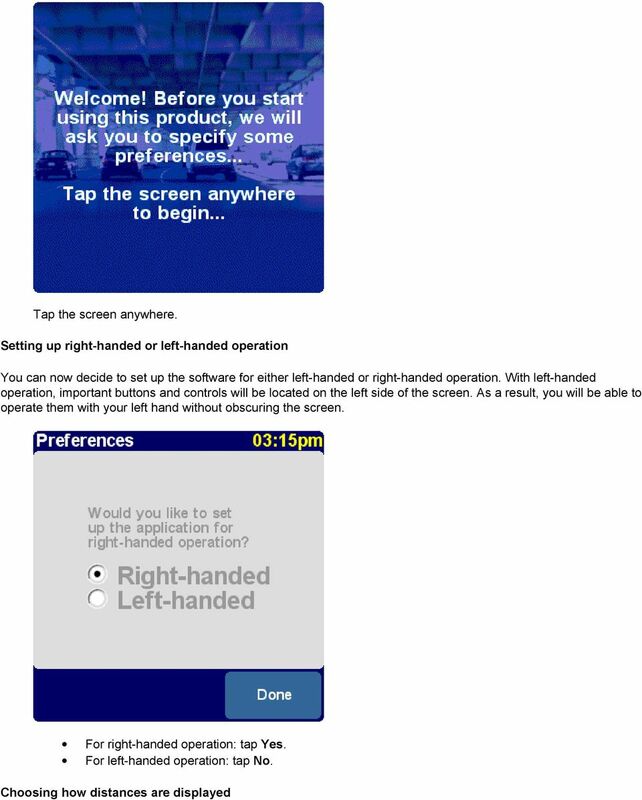 If the application operates for right-handed, switch it by tapping Left-handed lay-out. If the application operates for left-handed, switch it by tapping Right-handed lay-out Set schematic speed Modify the schematic speed by tapping Set schematic speed. You can set TomTom Navigator to hide the map when you go faster than a certain speed. Instead of the map, a much simpler, schematic design is used to display driving instructions. The simplicity of the "at-a-glance" schematics can be a true benefit when you need to concentrate on the road. If you do not enter a speed, or set the speed extremely high, you disable this feature.